That’s the number of single socks I have! That’s the most single socks I’ve ever had. 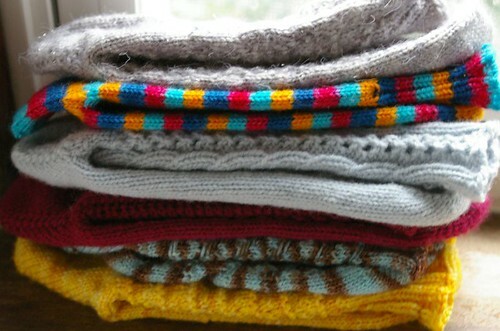 Now is time to knit the pairs. I’ll start the oldest WIP, the Snowflakes, then the Rococo and then the Marigold. After that we’ll see… I do have my eye on a sweater! I don’t feel too bad now about my three single socks. Well, almost three. My last sock has been sitting for weeks waiting for me to bind it off. Maybe I’ll get to that tonight at Knit Night. That’s a lot of single socks. At least you plan on finishing them. I still have one that is years old. I make myself knit them at the same time now so I don’t do that any more. I agree with Anya – very pretty. You know you could start a new fashion and wear two diffent socks at one time or you could make the second sock! Six single socks is just madness!